"I recommend that everyone interested in understanding and treating suicide read this book." 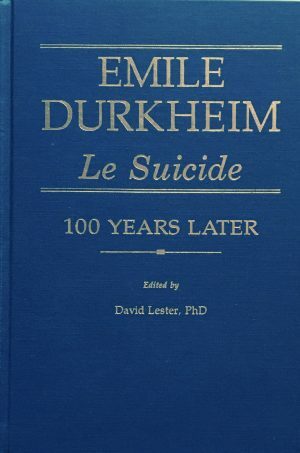 This landmark volume honors the 100th anniversary of the publication of Emile Durkheim's milestone book, Le Suicide, often described as one of the most important works ever written in the social sciences and the seminal work on suicide. Many other books were published before Le Suicide, but only Durkheim's has achieved unrivaled, overwhelming prominence. Remarkably, the importance of this book has not diminished or become lost with time; even today, practically every new book on suicide and self-destruction cites Durkheim's contribution and influence. What was so monumental in Durkheim's work that it left the indelible mark it has on current thinking on suicide? To address this question, renowned suicidologist Dr. David Lester invited 16 of the most highly esteemed suicidologists and scholars from around the world to write essays on their views of the great French sociologist and to evaluate and reassess the remarkable contributions he made to social and behavioral science in the light of present-day knowledge and assumptions. Some of the subjects addressed include: What was Durkheim's contribution to our understanding of suicide? Are his methods and conclusions justifiable? Have they withstood the test of time? What major faults have been identified in Durkheim's theory? How has Durkheim influenced the study of and present-day thinking on suicide? Also included in this volume is the first complete English translation of Durkheim's essay "Suicide et Natalite" (Suicide and the Birthrate), together with ground-breaking commentary on this important early work. An unparalleled bibliography accompanies this soon-to-be classic. Le Suicide, which was published near the end of the 19th century, is the most influential work on suicide in the history of sociology. As both the centennial of the book and a new millennium approaches, this is an appropriate time to review its ideas. Mike congratulations to Dr. Lester for conceiving and editing this volume. It is the first but will certainly not be the last work to evaluate Durkheim's great contribution in the light of the social events and changes of the past hundred years. This new work begins auspiciously with the preface by Dr. Lester, the larger part consisting of a valuable brief biography. The personality of an innovative thinker, and the origin of his ideas are inseparable. Lester provides evidence that depressive tendencies and feelings of anomie were present in Durkheim, and that these personal experiences were related to his brilliant sociological insight. An analogy may be made to Freud, whose self-analysis and dream analysis lead to psychological insights, including enduring contributions to the theory of depression and suicide. In both Durkheim’s sociology and Freud’s psychoanalysis, their original conclusions and methods have been questioned and modified by their followers. This does not detract from their value. Durkheim’s contributions and their influence could fill a library. Yet he summoned up his studies in one brief but memorable concept, that there is an inverse relationship between suicide and social integration. The rest, including this book and its very differing contributors, is commentary. Bernice Pescosolido's chapter on bringing Durkheim into the 21st century is an outstanding contribution to the study of suicide. She gives a clear and accurate statement of Durkheim's place and meaning in sociology during this time; and then suggests "a network approach" as an integrative concept suitable for our era. She does not ignore the problematical in Durkheim on his ideas; neither does she reject what is worthwhile. Instead, she recommends that sociologists apply and reshape Durkheim's theory "in the context of social, historical and cultural developments in family, economic and political spheres of life" (P. 280). However, there is more criticism than appreciation of Durkheim in most of the other chapters, although few of the criticisms or as constructive and those of Gibbs, Moksony, and especially Pescosolido; many are petty, and some are blatantly absurd. For example, Phillips, Ruth, and McNamara declare that "the most notable feature of Durkheim's theory may well be its insistence that the complex behavior of suicide is entirely determined by two factors alone" (p. 92) and that "Durkheim aimed at producing a comprehensive theory of suicide, and believed he had done so" (p. 94). They then "prove" that he did not deal with psychological and biological variables. The editor might have told Phillips, Ruth and McNamara that Durkheim did not claim that this was a complete explanation of suicide. Ferenc Moksony states that Durkheim's insistence upon staying exclusively within the social realm "is often seen as the hallmark of the sociological approach" (p. 112), a point also made by several other contributors. Few of the contributors see much merit in Durkheim's classification of suicide. Lester, however, describes the preliminary study on "applying Durkheim's typology to individual suicide." He relies upon published reports of suicide, which he uses to classify each case into only one type — egoistic, anomic, fatalistic or altruistic. The causes of most suicides, however, are buried in secrecy and other forms of concealment. It is very misleading therefore to rely upon written reports or other data that cannot be examined in depth. I have found clinically get the subgroups help in understanding and treatment. Ego and anomie have illuminated the foundations of despair and hopelessness that are endemic in the suicidal; fatalism reaches into the tunnel vision and conviction of the suicidal person that he or she is trapped and there is no other way out; while altruism brings out the self-sacrificing component behind many suicides, concealed within the belief that they are a burden to others. Durkheim’s subgroups are worthy of attention and even application. As the above comments indicate, Emile Durkheim has meant a great deal to me. His descriptions of social integration have led to the central goal of my family therapy—to restore a state social cohesion and a sense of belonging to the suicidal person, who inevitably feels isolated, abandoned and hopeless. Durkheim was the pioneer who brought such concepts into the mainstream of thinking about suicide. As Pascosolido says, “the Durkheimian framework remains the standard, it has characteristics that make it both elegant and powerful." She adds that "This movement toward transdisciplinary, multilevel frameworks may herald a second, more mature stage of social science, appropriate for this, it's second century." Durkheim demonstrated forever that in any such comprehensive approach, the social aspects demand equal billing. I recommend that everyone interested in understanding and treating suicide read this book, then read or reread the original by Durkheim. The result will be a fresher and deeper appreciation of it insights.